Students rehearse for an upcoming production of “Smudge” that will be presented in Wave Productions’ Second Annual Director Festival. The festival was created last year to give amatuer student directors a chance to grow. 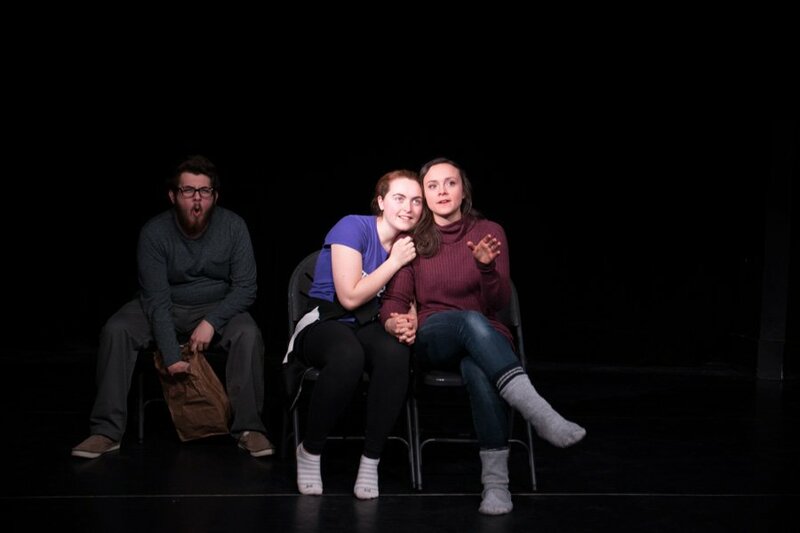 Three amateur directors will showcase one-act plays in this weekend in Wave Productions’ Second Annual Director Festival on topics ranging from AIDS to political satire to blindness. The festival was created last year by Hannah Fisher (Communication ‘15) as a chance for inexperienced directors to give directing a try, said Matt Ruehlman, the festival’s producer. The three 30- to 40-minute plays will be performed back-to-back on Thursday, Friday and Saturday at 7:30 p.m. at the Music Institute of Chicago’s Sherman Avenue Theater. The festival will be produced by Wave, a student theater board. Communication sophomore Sophia Sinsheimer, who will be directing a show in the festival, said students interested in directing petitioned to take part in the festival through interviews with board members of Wave. After the members selected the three directors, the board chose the plays that would be presented, she added. Medill sophomore Alyssa Wisnieski will direct “The Yellow Boat” by David Saar, a play about a boy named Benjamin who has congenital hemophilia and dies of AIDS at the age of 8. The play, based on a true story, walks through Benjamin’s life and how he and his family cope with his illness, she said. Wisnieski, who acted in middle school and high school, said she has never directed before and decided to petition for the festival after she took a playwriting class Fall Quarter. Communication sophomore Danny Kapinos will direct a political satire, Tony Kushner’s “Only We Who Guard the Mystery Shall Be Unhappy,” while Sinsheimer chose to direct “Smudge,” by Alex Bulmer. “Smudge” follows a woman who finds herself going blind and explores how she copes with this burden while in the midst of a burgeoning relationship with her girlfriend, Sinsheimer said. In preparation for the festival, Ruehlman said each student took part in a mentorship program in which they were paired with a more experienced undergraduate director. He added that they also took part in public master classes with faculty and graduate students who specialize in directing.